Sapphire is part of the corundum family (as is ruby) and comes in colours of blue, green, yellow, pink and colourless. They can produce exceptional fine and rare gemstones. Some stones are bi coloured or exhibit colour zoning. Corundum gets its colours from metal oxide impurities. The silk found in sapphires is caused by titanium oxide growing within the stone. These can produce star stones. 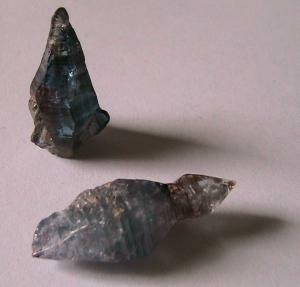 Corundum is found worldwide in igneous and metamorphic rocks or as waterworn pebbles in alluvial deposits. Crystals are often psuedo hexagonal. Sapphire strengthens heart and kidneys, stimulates the pituitary gland, thereby aiding entire glandular system, aligns body, mind, spirit, stimulates psychic abilities, clarity and inspiration.Creative expression, loyalty, love, opens connection with higher Self and spirit guides, strengthens will, expands cosmic awareness, dispels confusion, giving clarity and inspiration, enhancing will power and faith in judgement. Sapphire is the Traditional Birthstone of Taurus and in the 12 tribes of Israel it is the stone of the tribe of Issachar which is also linked to Taurus. Sapphire is the Mystical Birthstone of the zodiac sign Gemini. Sapphire is one of the Traditional Birthstones of Virgo and also Virgo's Ayurvedic Birthstone. The star sign Libra has sapphire listed as both its Traditional and Modern Birthstone. Sapphire is also associated with the star sign Capricorn. The 17th century Christian astrologer William Lilly associated blue Sapphire with the planet Venus and sapphire in general with the planet Saturn. The famous mineralogist George Frederick Kunz in his 20th century book 'The Curious Lore of Precious Stones' associated yellow Sapphire with Mercury, and blue Sapphire with Jupiter. Sapphire has also been linked with the planet Neptune. Yellow Sapphire activates Manipura - the Solar Plexus Chakra ( 3 ) and Blue Sapphire activates Vishuddha, the Throat Chakra ( 5 ). Beautifully formed milky sapphire crystal, almost white, semi opaque. Natural, unheated. 5.15 ct. Location: Sri Lanka. Dimensions: 1.8 x 0.7 x 0.6 cm. Gemmy pale lilac to pale blue sapphire crystal. Natural, unheated. 4.29 ct. Location: Sri Lanka. Dimensions: 1.5 x 0.6 cm. Semi opaque to trasparent and gemmy sapphire crystal. Natural, unheated. 6.41 ct. Location: Sri Lanka. Dimensions: 1.6 x 0.7 x 0.6 cm. Lovely small slightly bent sapphire crystal. Natural, unheated. 1.76 ct. Location: Sri Lanka. Dimensions: 1.5 x 0.3 cm.